Zimbabwe: Army takes over but denies coup – Royal Times of Nigeria. Zimbabwe’s military has read out a statement after taking over the national broadcaster, ZBC, saying it has taken action to target criminals. However, it said this was not a military takeover of government and President Robert Mugabe was safe. Zimbabwe’s envoy to South Africa, Isaac Moyo, earlier dismissed talk of a coup, saying the government was intact. 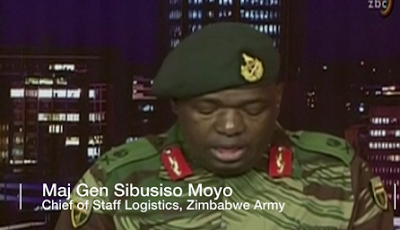 The statement read out by Maj Gen Sibusiso Moyo came hours after soldiers overran the headquarters of ZBC.